School Board accepting applicants for Lannon seat - Hamilton School District. The Hamilton School Board is accepting applications from Lannon residents interested in filling the seat of member James Long. The deadline for application is Aug. 1. School Board member James Long is recognized at his last meeting July 18 for 26 years of service to the Hamilton School District. 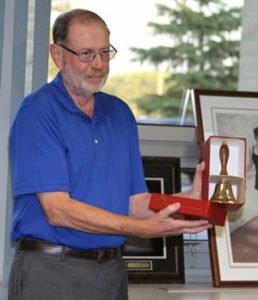 Long, who has served as the Lannon representative to the School Board member since 1990, resigned his seat effective July 19. In a letter to the School Board, Long said serving on the board has been an honor and privilege. “It has been a source of personal pride working with teachers, administrators, community members and fellow school board members to make significant progress over the years on behalf of children,” Long wrote. When a vacancy on the School Board occurs, the remaining members are responsible to appoint a qualified citizen to fill the position. The applicant appointed to the position must be a Lannon resident and will serve the remainder of Long’s term which ends in April, 2017. Aug. 15 – Appointed applicant takes oath of office at School Board meeting. Lannon citizens interested in applying for the position should contact the Superintendent’s Office at (262) 246-1973 x1108.